With Readly you can read World Of Animals Book Of Sharks & Ocean Predators and thousands of other magazines on your tablet and smartphone. Get access to all with just one subscription. New releases and back issues – all included. Is there anything more terrifying than the dorsal fin of a great white shark peeking through the waves? What about over 150 pages of the fiercest jaws and claws and the sharpest teeth the ocean has ever seen? The World of Animals Book of Sharks and Ocean Predators brings together the scariest monsters that make the deep blue sea such a terrifying place, from the usual suspects like the great white and the tiger shark to the octopuses whose camouflage talents mean they could be hiding anywhere. And just when you thought it was safe to go back into the water, we show you why even the fluffiest little seals can turn into a ferocious killer if it means their survival. 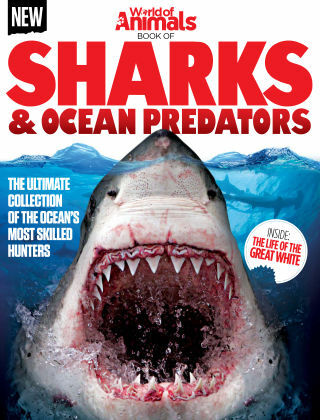 Featuring: Ruthless hunters - There's more to the icons made famous by Jaws and Deep Blue Sea; discover the truth behind these intelligent hunters. Deadly predators - There are over 440 species of sharks, yet we're most familiar with only a handful of them. Discover the most endangered sharks, and the prehistoric giants that make them look like small fry. Creatures of the abyss - There are more creepy crawlers and powerful predators hiding in the ocean, hunting for fish, seals, or even humans. Unexpected killers - Think the dolphin or the grey seal wouldn't hurt a fly? Think again, these creatures too are cunning killing machines when it comes to feeding time.